As Amsterdam’s party reputation gains strength, celebrating the New Year in Amsterdam is at the top of every travellers list. This year looks to be no different with official and unofficial events taking place all over the city. From 23.00 the Oosterdok is host to the countdown and free official firework display with traditional sing along with spectacular views over the IJ river. It pays to book your accommodation well in advance because of the massive popularity of the New Year celebrations in Amsterdam. From around 20.00 you will see a change in the city as the streets and squares gradually fill up with people and the trams and buses stop running until the early hours of New Years Day. There’s always a huge variety of events on in Amsterdam, most of the most popular city centre bars will charge an entry fee of around €20 from 20.00, but there’s always entertainment and refreshments within easy reach. 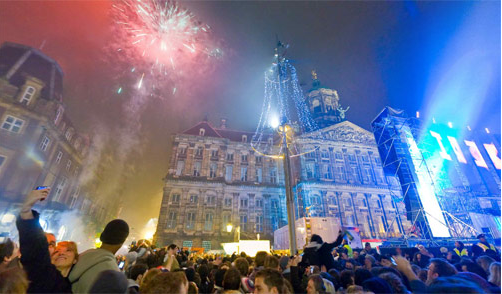 People gather to celebrate and countdown to the New Year on Dam Square, Rembrandtplein and on the Nieuwe Markt, all within easy walking distance of one another, each with their own charms. The better restaurants tend to be reservation only on New Year’s Eve so it’s the best time to experience the real Amsterdam with street food, pizza by the slice, falafels, gluhwein and the traditional Dutch delights oliebollen, that are something like a dense round sweet doughnut. If you’re on the streets in Amsterdam at New Year it pays to keep your wits about you, the obvious dangers of being in any city at night, pickpockets and such remain and with the party atmosphere it’s easy to get distracted and lose your possessions and even your companions. Fireworks are everywhere and although their sale is strongly regulated throughout the year, New Year’s Eve in the Netherlands seems to turn everyone into a mad kid with a lighter and a pocket full of fireworks. There’s a lot of advice around to keep you safe, some of it ridiculous most of it just common sense but it’s safe to say that you haven’t seen firework madness until you have seen the Dutch with fireworks on New Year’s Eve in Amsterdam. A comprehensive guide to what’s on in Amsterdam. Trip Advisor’s take on New Year in Amsterdam. The iAmsterdam Ticket Office on the Leidseplein is the best place to get information and tickets for almost every event in Amsterdam. The Last Minute ticket Office selling half price tickets shares the iAmsterdam office.